Instead of worrying about how much time you have or whether you’re wasting your precious time, shift your thinking to clearly see what time it really is: right now. And right now you can do anything! Take stock of what you have—literally as well as figuratively—from the shoes in your closet, to the contacts in your phone, to the beliefs in your heart. See it all. Give thanks for it all. Get creative with it all! Look for new combinations, fresh ideas, unseen opportunities. 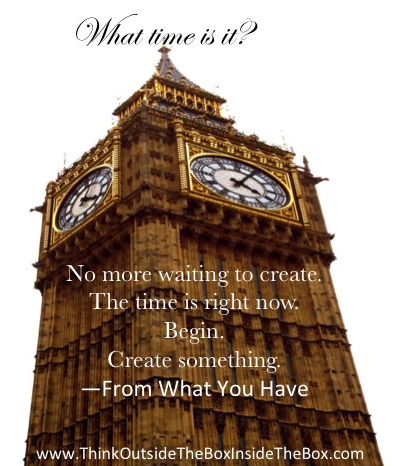 Create something from what you have right now. No more waiting to create. What are you going to create today? The time is right now.